Kolkata, 15thNovember, 2014: Hitech Mobiles, one of the fastest growing Indian Handset brand, won the prestigious Brand Excellence Award from CMO Asia as the Best Emerging Brand in the mobile phone category. The award ceremony held during the ongoing World Marketing Congress at Mumbai. "We are really proud to have won the award for the Best Emerging Brand. We have a vision of making mobiles suitable and affordable for every age group as well as income group in India.It’s a big achievement for our company to receive such an award. 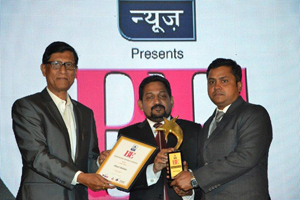 It gives credence to our hard work and commitment in providing quality product and service",said Md Gyasuddin, Managing Director, Hitech Mobiles. The Brand Excellence Awards is an annual appreciation by CMO Asia, the Chief Marketing Officer’s council of Asian Region, a peer power affinity network of top marketing decision maker. The award is supported by World Brand Congress, Asian Confederation of Business. The Awards is an independent brand recognition exercise initiated to give recognition to those brands and marketers who have achieved extraordinary success from innovative and effective marketing practices, with regard to the particular circumstances of different industries, budgets and the diversity of marketing programs. The Brand Excellence Awards are not only based on financial valuation, but by consumer preferences also. The awards are held to foster marketing awareness in the professional community and inspire aspirations to achieve marketing excellence. The Mission of the Awards is to educate and disseminate the importance of branding in India, with the aim that a branding culture aided by best practices will then position India amongst the world’s great nations. Hitech Mobiles is a Kolkata based mobile phone maker and eastern India’s largest mobile phone brand. The company sells feature phones, smartphones and Tablet in Rs 1,000 to 7,000 price brand in the tier 2, tier 3 cities and rural areas of the country.